Todd is the son of Dale and Carolyn Williams. His introduction to organized sports came at age 7 in the Pop Warner League in Columbus. Progressing through the various age levels, he came under the tutelage of Cecil Brown, Bit Tanner, and Everett Saunders among others before he played for the most successful coach in Waycross history, his dad. In high school, Todd earned 1 letter in tennis, 2 letters in football, 3 letters in basketball, and 4 letters in golf. The two years Todd lettered on the varsity football team they compiled records of 9-2 and 14-1. They won the region title both of those years and were also state champions in 1981. Todd was one of four permanent captains of that team. His senior year, he was selected to the All-Region and All-State teams and was an honorable mention choice for the Addidas’ All-American squad. He was the MVP for the Bulldogs and was the statewide player of the year in class AAA. He culminated a spectacular high school career by playing in the North-South All-Star game in the summer of 1982. Todd was awarded a full scholarship to the University of Georgia. He lettered in football at GA in 82, 83, 84 and 86. Because he was a red-shirt one year, he had the unique distinction of going to five Bowl Games: Sugar, Cotton, Citrus, Sun and Hall of Fame Bowl. Playing on the same team with Hershel Walker, Todd became the back-up quarterback in his freshman season when Ga. won the SEC Championship. He alternated at QB in 1983 before he sustained a leg injury. In 1984 he was the starting QB until a shoulder separation sidelined him. After retuning, he then proceeded to break a toe. He was red-shirted in 1985 after a pre-season knee injury. Todd became more of a payer-coach in his 5th year working with young QBs and signaling in plays from the sideline. 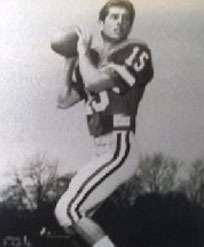 Todd was selected to the 1986 SEC All Academic Team. He graduated from the University in June of 1987 with a BS of Education. Todd has two sons, Justin and Jake. He currently lives and works in the Waycross area.